Recently the New York Times printed a photograph (by Nat Farbman) of the young Lawrence Ferlinghetti – one of the leading lights of the Beats – reading his work to a group of onlookers. There he stood, dark and dashing in a tweed jacket and cord trousers, looking every inch the charismatic 1960s poet. At his feet lounged a young man in a similar outfit and a woman in a black sweater and tight skirt. People are drinking wine from tumblers. As well as being an admired poet, Ferlinghetti was one of the co-founders of the City Lights Bookstore and Publishers. He was the first publisher of Allen Ginsberg’s Howl, for example, which – whatever you think of it now – was a tornado blasting its way through the poetry landscape of the time. San Francisco is a different place than it was when Ferlinghetti first opened the doors of City Lights in 1953. It was never a city associated with business, but with alternative lifestyles, freedom and revolution. Paul Kantner of Jefferson Airplane called it “49 square miles surrounded by reality.” Now, with the arrival of Google, Apple, Twitter and the – seriously – 5,249 tech start-ups in the city, there’s no place for California Dreaming. City Lights is not just a bookstore but a vital landmark on the map of modern culture. Ferlinghetti is 99 this year – what’ll happen when the inevitable occurs? I fear poetry isn’t that high on the list of requirements of the twentysomething techies waiting for the WiFi enabled buses to whisk them off to Silicon Valley, so will it just become another artisan coffee shop? I thought of this recently when I was having dinner with a close friend in Greenwich Village. We’d booked a table at the magnificent Pearl and were enjoying a pre-dinner drink at the Cornelia Street Cafe. The Village is another place where cultural history swirls around you like ghosts in a cartoon film. Think of those writers, artists and jazz musicians who lived, worked and played here. The Bottom Line and the Village Gate – names familiar from the sleeves of jazz albums of the 1950s and 1960s, are gone – replaced by a pharmacy and university departments. Shouldn’t places like City Lights be preserved, immune from rent rises and speculation? These are the names that pepper the cultural histories of the 20th century and should be as precious to us as medieval castles or Tudor chimneys. It’s not just architectural excellence that should be preserved but those places that contributed to the spirit of the times, and preferably not turned into tacky museums. Slap them all on the National Register of Historic Places before it’s too late! So what is that thing that heads this post? Is it Ferlinghetti’s appendix, perhaps? Far from it: it’s a steamed clam, drawn from a photograph of one taken from my dinner companion’s plate. Or should I say it started off as a drawing of a clam, but then I added more and more colour and texture to it and made it into something that is now just an abstract idea of a steamed clam, a variation on a theme of a steamed clam. Don’t worry, chef Rebecca Charles would never serve this to you in Pearl. 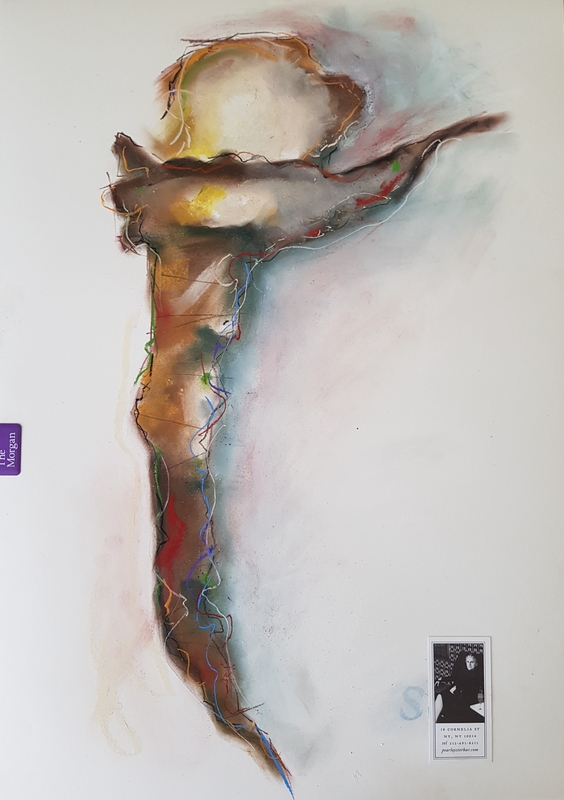 In this year of rethinking the direction of my painting and drawing – trying to rein in some of the tangents I follow and develop a recognisable style – I’ve more or less decided to follow two paths simultaneously. First, there is the line drawing path. I do enjoy drawing people wearing animal heads or household items on their noses. I like ‘illustrating’ Carly Simon’s imaginary friends or a woman in love with a fish (a similar idea won several Oscars, let me remind you). It’s fun to draw Benedict Cumberbatch as a vampire, legendary gallery owner Kasmin naked and the lines and folds on the faces of Jasper Johns. On the other hand, I love painting fruit. My passion for the lovely quince is well known to regular readers of this blog. 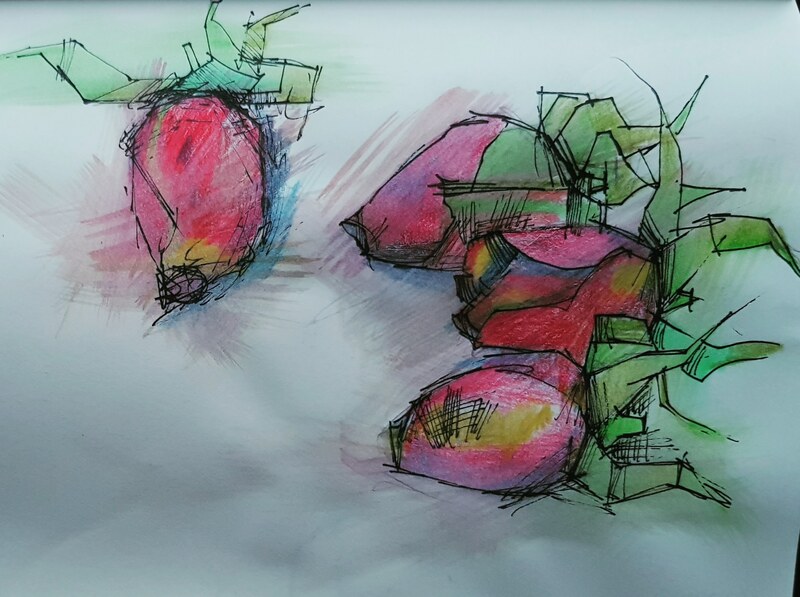 Occasionally I’ll let my head be turned by a ripe pomegranate or an exotic purple mangosteen, a gaggle of plums or even a delicately-coloured Swede. Fruit favours acrylics or oils, I think: layering on those colours and shades, adding a touch of shocking blue to a red and orange pomegranate or positioning a highlight of purest titanium white – all very satisfying. This makes shopping in a well-stocked market or a foreign food store even more of an adventure. For me, Borough Market in London is a place to buy overpriced cheese and subjects for painting. That’s where I first discovered the almost comic mangosteen, shaped like a smaller, purple version of those plastic tomatoes that hold ketchup in transport cafes. My latest hunting ground is Wegmans, a supermarket in Rochester, NY, on my frequent visits to this under-rated American city. For some time I’ve been eyeing the blousy pitaya (dragon fruit), vibrant pink with little green and yellow horns. Only the fact that I’m here without my acrylics has prevented me from dropping a couple into my shopping cart. Then last Saturday, while seeking out herbs for a New York Times recipe which pairs chicken and mushrooms with cognac and madeira sauce, I discovered tomatillos. Like small green tomatoes wearing diaphanous outer skins over their shiny green bodies, these Mexican fruits are mainly used to make salsa verde. You can gently peel back the delicate husks, allowing them to tear into interesting shapes that describe the arc of the succulent green flesh where they remain joined to the fruit. I drew them in charcoal, in pencil and, at the top of this post, in watercolour pencil and ink. At under 70 cents for three, they’re the cheapest still life models I’ve found. Now, where can I get a green pomelo? Sometimes I look at some of the artists I follow on Instagram and wonder if they ever get bored, painting the same type of thing day after day. If I paint a piece of fruit today, tomorrow I want to start a line drawing of a man wearing a mask in the form of a fox’s head. Variety, as they say, is the spice of life. 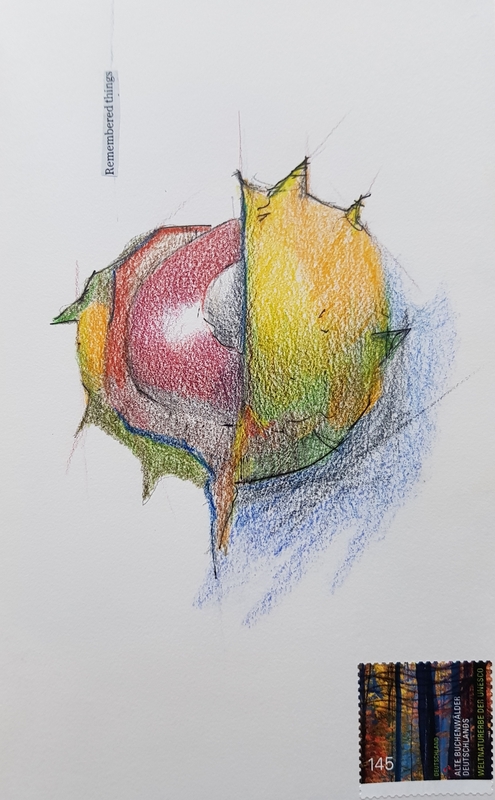 That seemed to do the trick, and by the end of the week I was more relaxed and, after a short detour into a painting of quinces, I finally reached the rather more abstract pomegranates at the top of this post. The full sequence can be found on Instagram. As I wrote to Tara at the end of the seven days, it was an exhilarating experience. Exploring different ways to approach a single subject every day for a week was astonishingly liberating. I felt no compulsion to produce ‘finished’ work even though I was posting it on Instagram. The journey was the key, empowering me to experiment. Others, it seemed, had the same experience. Tara was the perfect companion on this journey: her admission that her own theme had gone somewhat awry but she was going to enjoy it anyway inspired and relaxed many of us, I felt. If, like me, you like to flit from subject to subject, I can wholeheartedly recommend a short period of concentration on one, using different media, pushing your style in new directions, not worrying about the outcome as much as enjoying the process. If we can do that, it would appear, an ‘end result’ suddenly makes itself apparent.